They’re both registered Republicans, they’ve both voted in every election since forever, and they both want to be the mayor of Pinellas Park. 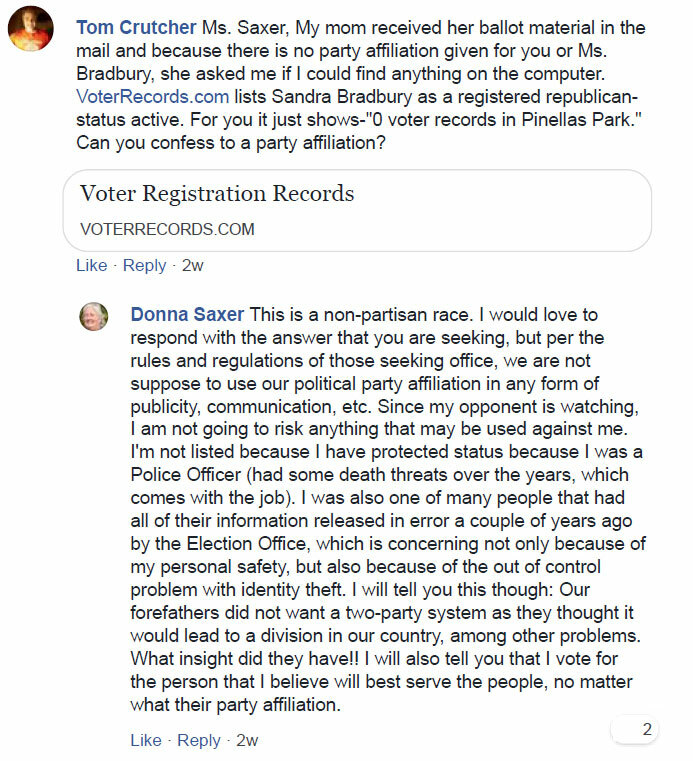 That’s where the similarities end between current Pinellas Park mayor Sandra “Sandy” Bradbury and her opponent, mayoral candidate Donna Saxer. In this article, we’ll try to cover what has been reported so far by others while adding our own investigative findings, all in an effort to inform voters and interested parties. 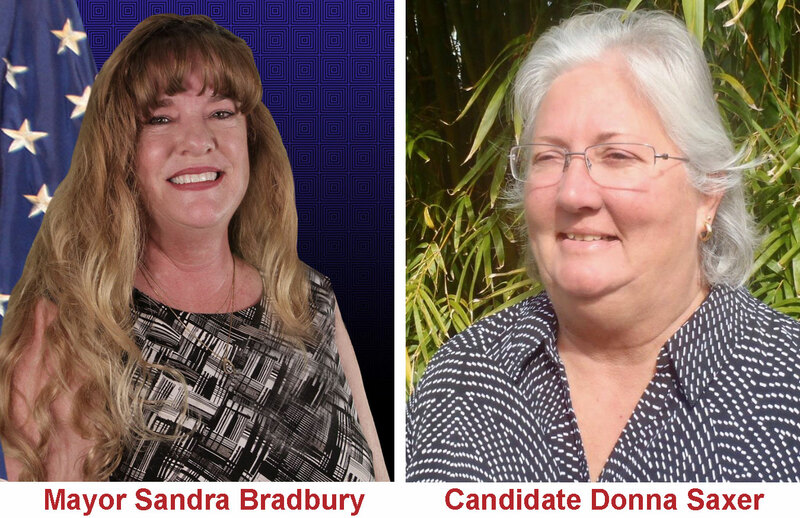 Saxer has been endorsed by former mayor Bill Mischler, whereas Bradbury has been endorsed by the local firefighter union, the local police union and the Pinellas Realtor Organization. Bradbury was elected city councilor in 2002, elected mayor in 2012, faced no opponent in 2014, and won re-election as mayor in 2016 with 57% of the vote. “I am bringing up facts about the problems with our city government that my opponent, and others, do not want to come out,” first-time candidate Saxer told the Guardian. She says more police officers are needed, citing in part because officers don’t have “enough time to handle all of the investigations.” Bradbury says that crime in the city has dropped and that the police chief says he has an adequate staffing level. Saxer is former Pinellas Park Police officer who left the department in 2016. Saxer’s annual performance evaluations show that she received a rating of “Exceeds Expectations” or higher 18 out of her 24 years with the department. However, her personnel record also shows that supervisors said she “routinely requests to not work with others” and was not an “effective team member.” Saxer refused to sign her last performance appraisal in March 2016. She also refused to sign her 2000 and 2001 appraisals. Saxer claimed in a Facebook post on February 8th that she “had some death threats over the years” while working as a police officer. We asked whether she has any of those threats to law enforcement, but Saxer did not respond to that question. The website Tampa Bay Reporter (TBReporter) reported that Bradbury had been chronically late on her water bill. Saxer argues that Bradbury should’ve been treated like other citizens, had her water service turned off and had to pay the $35 reconnect fee. Bradbury told the Guardian that she “never asked anybody to not cut off my service, never had one conversation with city employees about my water account, paid every late fee owed” and that her account is now current. Bradbury attributed the long-standing payment problems to faulty auto-pay at her bank. A public records request for Bradbury’s water account entries confirmed that her account is now current. 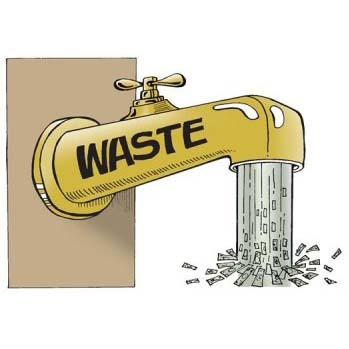 In 2017, Bradbury was billed $1,163 for water and sewage, and an additional $476 in late fees. Saxer argues that Bradbury, as mayor, should have paid on time. Others argue that the city’s hefty monthly late fee of 10% on any unpaid balance means that the city is financially better off when people like Bradbury don’t pay their bill in full. That is: as long as the bill is ultimately paid. However, elected officials are not part of the city administration and can never be bound by city policies covering employees. There are remedies in cases of real or perceived abuses by elected officials, but not through city administrative policies. The job of mayor is a part-time job paying approximately $21,000 per year. Saxer is retired and Bradbury works for a civil engineering firm. The election is March 13th and the mail-in ballots have already been mailed out. Pinellas Park is almost 17 square miles in size, has 52,000 full-time residents and increases by another 25,000 in season. It’s a “Sign of the Declining Times” that the Tampa Bay Times covered the 2016 Pinellas Park mayoral election, but are not covering it this year. It’s now left up to online news websites like TBReporter and our own to provide coverage. The decision about who should be mayor, however, is left up to the voters.